Tour Soldier Field $15. Experience both the historic and modern-day journey of Soldier Field Stadium. When: Open tour schedule will be updated at the end of each month. (Click on “Tours” then scroll down). Additional tour dates and times for the following month will become available then. No weekend tours. Tours are approximately 45 minutes to 1 hour. Tour times are subject to change. Details on how to reserve below. Where: Soldier Field, 1410 S. Museum Campus Drive, (312) 235-7000. Gate 1 (south side of stadium). A behind the scenes tour that includes the Field, South Courtyard, Doughboy Statue, Grand Concourse, Colonnades, Skyline Suite and Visitors Locker Room. Private Tours of Soldier Field are great opportunities for school groups or other organizations to have an exlusive behind-the-scenes look at the stadium.There is a 10 person minimum to book a Private Tour. Group Tours run Monday through Friday 9AM until 4:30PM. To book your tour, click on the “Book Now” button & fill out all areas on the form before clicking “Submit”. You will receive an automated response the same day you submit your application and an email confirmation within 2 business days, if the requested date and time are available. Tours must be booked at least 2 (two) weeks in advance. Not all dates and times will be available due to other tours and events scheduled at the stadium. Tours become finalized when the tour confirmation has been sent. A 25% discount will be applied to tour groups of 25 or more or active military and veterans. Free bus parking is available at Gate 14 for one vehicle for the duration of the tour. A credit card is required to reserve your tour. The credit card will be charged $50.00 as a down payment and will be applied to your total dues on the day of the tour. Tours will not be conducted on game days, during special events or days following major events. Dates, times and areas of availability are subject to change. Cameras and still photography are permitted; video recording is strictly prohibited. 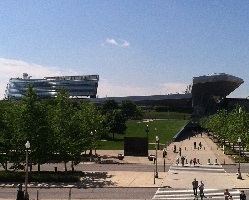 Public access to the inside of Soldier Field is available only on stadium tour. Tours are wheelchair accessible; however we do not provide wheelchairs.